Officially unveiled in August 2012, the LG Optimus G is being released in Korea in September, with availability in other markets set to follow from October. The NFC-enabled flagship handset runs Android 4.0 and sports a quad core Snapdragon S4 Pro processor running at 1.5GHz, a 4.7-inch 1280 by 768 screen and LTE. The phone does not have a removable battery cover, though LG claims the battery is good for 800 charge cycles. The micro SIM is inserted into a slot on the side of the device, and there is no support for a MicroSD card. A leaked photo of a device referred to as the Eclipse 4G LTE was published by Brief Mobile in May 2012 and showed an NFC antenna mounted inside the battery cover. Eclipse 4G LTE is understood to be the name the Optimus G will be marketed under by AT&T in the US. The phone is also known by the model numbers LG LS970 and LG E970. 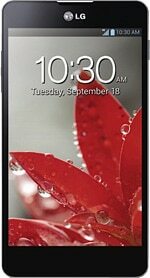 Find out more about the LG Optimus G at the manufacturer’s website.